Myanmar is characterized as an agrarian economy with 66.1% of the population currently residing in rural areas, however it is on a fast track mode to urbanization (33.9% as of 2010). Population density varies across the country and coastal states. According to World Urbanization Prospects (2011), overall population growth has been declining since 1980, and in 2005 population growth in rural areas registered negative growth with further decline anticipated (1% between 2010-2015), whereas, urban population growth rate will be on an upward trend (3% between 2010-2015) and it is expected, that by 2014 Myanmar will cross the 50% landmark. One scenario projects that large cities will eventually become mega-cities, medium size cities will become large cities and many new smaller cities will crop up across the country (DPO Review). The goal of “Disaster Risk Reduction for Safe & Resilient Burmese Coastal Communities (DRR-SBCC)” is to “enhance resilience of coastal communities to current and future risks through evidence based information for policy advocacy and mainstream disaster risk reduction and climate change adaptation into development planning”. Objective 1: Minimize exposure and vulnerability of coastal communities to current and future risks through safe settlement planning by assessing existing policy and practices related to land use planning for town and city planning, and develop guidelines for land use planning in the context of Myanmar and demonstrate priority mitigation activities to minimize future exposure to disaster risk. Further it will establish linkages for training of relevant staffs on land use planning at Urban Research and Development Institute (URDI), under the Ministry of Construction. Objective 2: Institutionalize capacity building of carpenters in vulnerable reduction of built environment through disaster resilient construction practices and though incorporation of green building concepts. 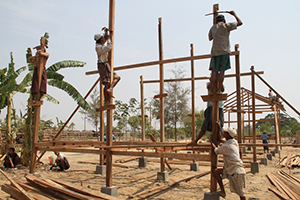 In addition to training of carpenters from the pilot townships and communities in disaster resistant construction practices, this activity will strategically support competency based skills certification for construction trades (carpentry) through Ministry of Construction and Myanmar Engineering Society. Objective 3: Advocacy on all of the above targeted to high level government officials at National, State and Township levels and awareness raising at community level. The project supports training of carpenter’s training along with its MCCR partners in eight pilot townships to promote safer construction and prioritized small scale mitigation activities at the community level. 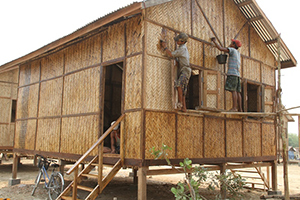 At strategic level, UN-Habitat is working with Ministry of Construction and Myanmar Engineering Society (MES) in development of training modules for Carpentry Trade (Construction) along the lines of National Skills Standards Authority (NSSA) curriculum. Currently trainings focus on providing Competency Based Certification through MES’s on Occupational Skills Standards, and rollout trainings at township level while the NSSA system is under development in Myanmar. The programme activities support broader NSSA support to MOC along with its other ongoing programme funded by MFA Norway and USAID-OFDA. Based on the national guidelines for TDMP, UN-Habitat is working with National, State and Regional Government and Township authorities of 4 townships to review and update TDMP by strengthening Township Disaster Management Committee and Sub-committees through a process approach. The TDMP process also explores linkages with the CBDRM efforts of MCCR partners at community level. Furthermore, it also ensures differential needs of vulnerable groups are addressed through an inclusive approach. Bago, Taungoo and Sagaing are medium size cities along the Sagaing fault line, which has experiences major earthquakes in the past and have undergone considerable changes. Myanmar Engineering Society (MES), Myanmar Geo-Science Society (MGS) are the lead agencies in the country which has considerable knowledge and capacity and are undertaking the assessment for 3 cities in consultation with National, Region, and Local level Working Groups comprising of key stakeholders with specific roles and responsibilities. The Risk Assessment information will also lead to further to specific recommendations and also to develop long term action plan for proactive risk reduction. It is also envisaged that through the engagement of National Agencies, it can facilitate in-country capacity building for the professionals to undertake such complex endeavor in future. With the ongoing decentralization process, there is a need to scale up DRR awareness among all stakeholders. The project has supported RRD at National and State/Regional in provision of 15 Sets of Training Aids (Laptop, Projector, Portable Audio System and Generator) for training outreach and awareness programme. In addition it partners with DRRWG in conducting advocacy workshop on DRR targeting Regional Government Ministers, Parliament members and officials who are engaged in policy making. The process will also result in collecting their local priorities for each State/Region which also complement the MAPDRR. Recognizing the need to have relevant tools for enhancing earthquake knowledge, the project will develop Risk Communication Tool for Earthquakes in partnership with all key stakeholders.